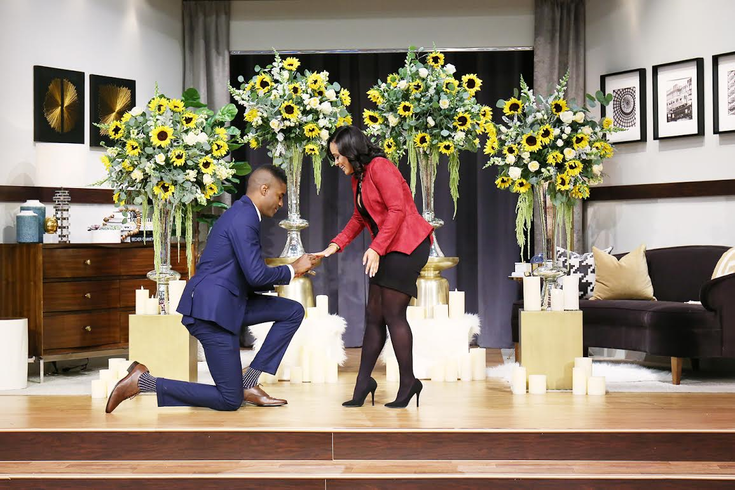 Philadelphia philanthropist Nehemiah Davis proposes to his girlfriend Silvina Mendoza on “The Steve Harvey Show." Mustache hall of fame member Steve Harvey helped a Philadelphia philanthropist propose to his girlfriend by having the couple on his television show. Nehemiah Davis, 29, who has been profiled for his charity work by local media in the past, will appear on "The Steve Harvey Show" in a episode set to air Wednesday. In his segment, Davis plots with Harvey to propose to his girlfriend of five years, Silvina Mendoza, also 29, before bringing her out on the stage. Mendoza quickly finds out that she isn't just on the show because of the couples' charity work, and when Davis pops the questions she — surprise! — says yes. You can watch the proposal before it is broadcast in the clip below. After the big question, Mendoza is again surprised on the show with a performance from her favorite singer, Maxwell. While a publicist for Harvey gave permission to upload that clip, as well, I've opted not to include it here. If you want to see that performance, you can watch for yourself at 2 p.m. on NBC on Wednesday. Instead, I'm including one of my all-time favorite clips on YouTube ever: a compilation of Harvey's baffled facial expressions on "Family Feud." Kidding aside, Davis' foundation runs a number of charitable programs for children, senior citizens, and homeless residents. You can find more information about his organization here.